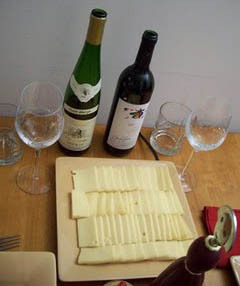 The first time I had Raclette was many years ago when I was visiting a friend in Switzerland. The snow was piled high and the temperature frightfully low, but huddled around the hot Raclette machine, we felt toasty and warm. A cheese originating in the Swiss canton of Valais, home of the Matterhorn, today Raclette is also produced in the French regions of Savoie and Franche-Comté. Whole Foods always has Raclette, but I've also seen Raclette at many other quality markets, as well as on Fresh Direct (for you New Yorkers). Although it's very cool to eat traditional Raclette in the Alps, where they heat up a half-wheel of cheese and scrape the gooey goodness right onto your plate, potatoes, or bread. Modern Raclette grill machines have little individual trays in which you melt slices of cheese yourself at your table. A Raclette meal is super easy and great for dinner parties. You just need to have the Raclette grill machine, which you can find at Sur La Table. Most machines available in the U.S. have a grill on top, so while your cheese is broiling under the grill, you can cook up some vegetables (or even kebabs or Merguez sausage) on top of it. The only thing you have to do to prep for this meal is bake / boil some potatoes, slice the cheese and vegetables, chop the chives and scallions, and lay out your charcuterie and condiments. And if you have cheese left over after the meal, it's heavenly melted on a burger, in a panini, and for grilled cheese sandwiches -- it melts beautifully. There's no real method for eating Raclette, save for melting it in its tray in the Raclette machine. So you may get your machine and then wonder what you're supposed to do. Truth is, there's no rules, but here's a couple ways to enjoy Raclette. Start by throwing some veggies on the grill-top, first brushing them with oil and seasoning with salt and pepper. Then start melting a slice of cheese in its tray while on your plate you lay out some Madrage ham, Prosciutto or Mortadella. Center a piece of the potato on the meat, sprinkle on some scallions, chives or herbs, then pour the melted Raclette over it. Roll up the meat so it looks like a little burrito, and devour it while your next slice of cheese is melting. I've also done a Raclette "taco," where I leave the cheese under the grill until it begins to get crispy, then I quickly fold the cheese crisp like a taco shell before it hardens, and I put some meat, potato and herbs inside, topping it with sour cream. Despite this meal being heavy on the charcuterie, I once had a surprise vegetarian guest for a Raclette dinner. Thanks to the ability to grill so many vegetables, he didn't starve. In fact, he enjoyed the Raclette so much that the next day he went out and bought a grill machine for himself. Proof positive that even a vegetarian can enjoy Raclette. A Raclette grill can set you back anywhere from $99.00 to over $200.00, but they last for years and years so long as you clean them thoroughly after each use and pack them away in their original box for the summer. Once you invest in this clever little machine and get a mouthful of smooth, sweet Raclette, you'll find the pangs of guilt for buying such a non-essential gadget melting away. Winter is the perfect time for Raclette, so go ahead and bring your Raclette grill on a ski trip. Outside of Tartiflette, there's no better food to warm you up after a day on the slopes. But even if you're not skiing, as long as you're humming "Baby It's Cold Outside" you'll enjoy Raclette's comfort food qualities--not only does it warm your tummy on the inside, the hot machine warms you and your guests on the outside too. In fact the machine provides so much warmth that you'll want to ditch your sweater and keep your white wine away from it. 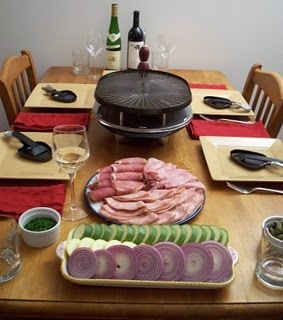 Raclette is a meal you and your guests will enjoy because it's different, interactive, and fun. Just be sure to crack a window, because this yummy cheese, like most great cheese, is stinky when melted!